Des Brooks Service of Thanksgiving from Richard Thorn on Vimeo. 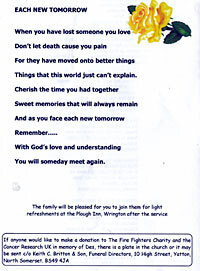 Desmond Philip Brooks, (Des) aged 66, died peacefully on 3rd August 2008 at his home near Cheltenham, Gloucester following a short illness with cancer. 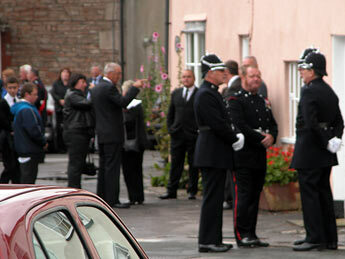 His funeral service was held Wednesday 13th August 2008 at All Saints' Church, Wrington, in Somerset, followed by interment in the churchyard where his parents and grandparents are also buried. Des was born on 10th May, 1942 in Wrington, as were his parents Reg and Alice Brooks. Des worked on local farms before serving in the Grenadier Guards and was proud to be involved in the changing of the colours, and served overseas. Later he had a successful career for over 37 years as a fireman and driver in Wrington, Yatton stations and Bristol Airport. 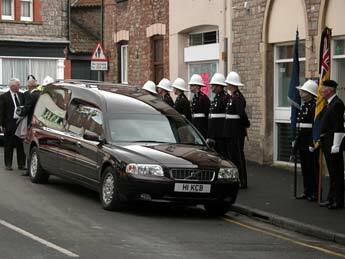 Because of his long career in the Fire Service over 100 firemen attended his funeral, with them, going to the church from his old local the Golden Lion Pub, the drill squad marched behind the hearse. 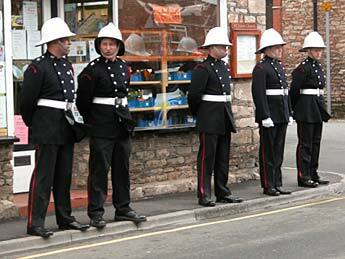 He was given a guard of honour on entering and exiting the church and the last post was played at his graveside. He is survived by his partner Tina, his much loved daughters, Trudy, Esther and Mac and sons Grant and Rodney, brothers Robin and Theo. 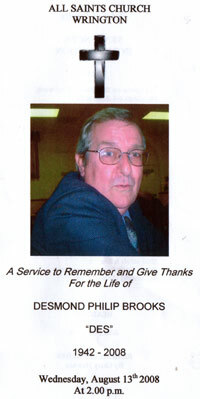 He had 7 grandchildren and 5 great grandchildren. 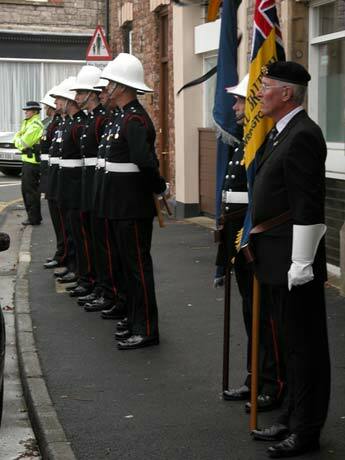 He was heavily involved in the local community working with local lodge, and he was also a member of the Wrington branch of the Royal British Legion for over 40 years and was a standard bearer for over 20 years. In his spare time he enjoyed the restoration of old tractors, and was very fond of gardening and caring for small stock. His family and many friends paid tribute to him, and he will be sadly missed. 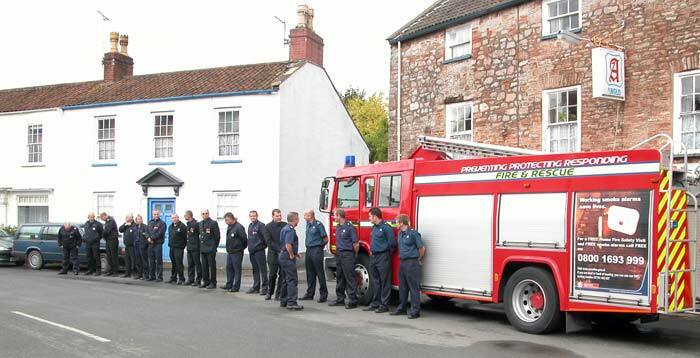 In memory of Des donations can be made to The Fire Fighters Charity, and Cancer Research UK, courtesy of Keith Britton & Son, Funeral Directors 10 High Street, Yatton, Bristol BS49.